That's a shame. This sounded like a book with a lot of potential. I'm in the middle of Patrick Rothfuss's The Name of the Wind and I'm feeling much the same thing. Wonderful writing, wonderful world, rich characterization, but a feeling that it's all bogged down without any real forward progression. It's starting to feel like a string of episodes in a sitcom, although admittedly of greater quality. Too many events, not enough change. I think your first paragraph is a really distasteful and idiotic cliché about American society pre 9/11 (and even post 9/11, for that matter, as if anything really changed) as well as a simplistic thought about the issue of cultural complacency and societal change. Are we supposed to be thankful for tragedies, like 3,000 dead, so we can realize a valuable life lesson? Agreed, Chester. Also, strike the first paragraph and first two words of the second, and...the review is just as clear. The bizarre 9/11 reference adds nothing at all. I thought that the Magician's Apprentice was a great book. 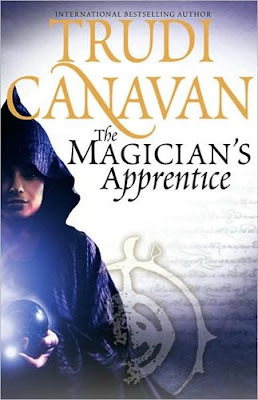 The way Canavan delves into the stories and minds of each character is what fascinates me. It also helps the reader understand more about this world. Truely a great boook! I'd give it a Five Star Rating!! I was disappointed with "The Magician's Apprentice". It was a good read, but I found the book predictable and inconsistent at times. For example, I noticed at one point the random introduction of the term 'Black Magic', a term which supposedly came about when the guild banned of Higher Magic. I also found the book glossed over the ending and other parts which would have been interesting. Overall a good book, but one that didn't live up to my expectations based on Canavan's other works.